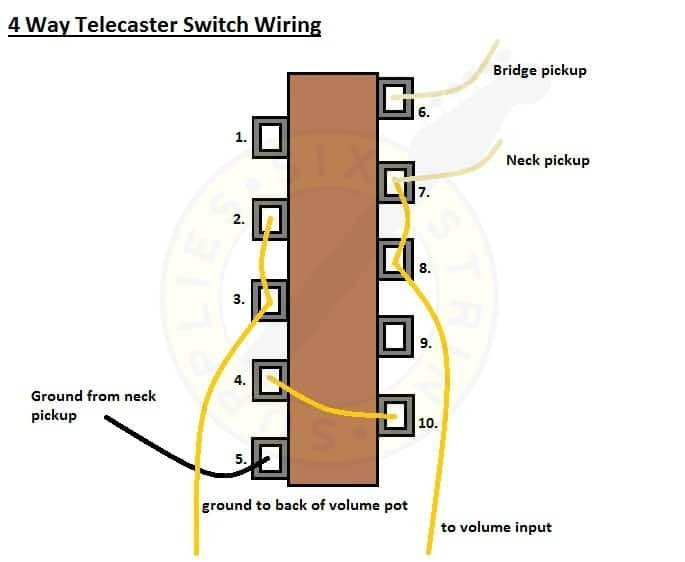 The popular 4 way Telecaster wiring mod goes one better than the classic 3 way Tele wiring. 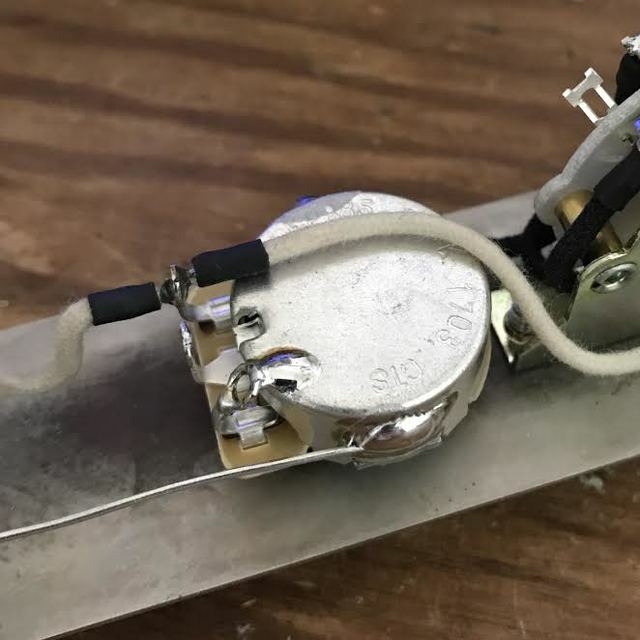 With standard Telecaster wiring, the switch gives you the options of playing the neck pickup, the bridge pickup and playing both in parallel. By upgrading to a 4 way switch, this mod allows you to play both pickups in series, offering a fuller, fatter tone. The best thing about this mod is that you actually keep the classic 3 way options still available to you. We recommend reading this article and studying the wiring diagram before attempting the mod yourself. 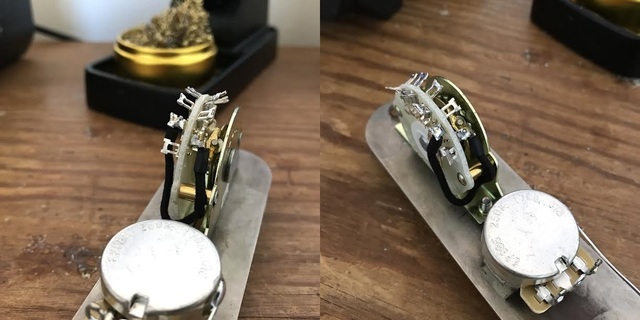 The components used are from our 4 way Telecaster wiring kit. - Practice makes perfect - its best to practice on low quality/spare parts to get a feel for your soldering equipment. Its not the end of the world if you burn out a pot or make a complete hash of things but it saves you having to buy the components again. - Soldering iron - Keep your soldering iron clean and tinned throughout the process. 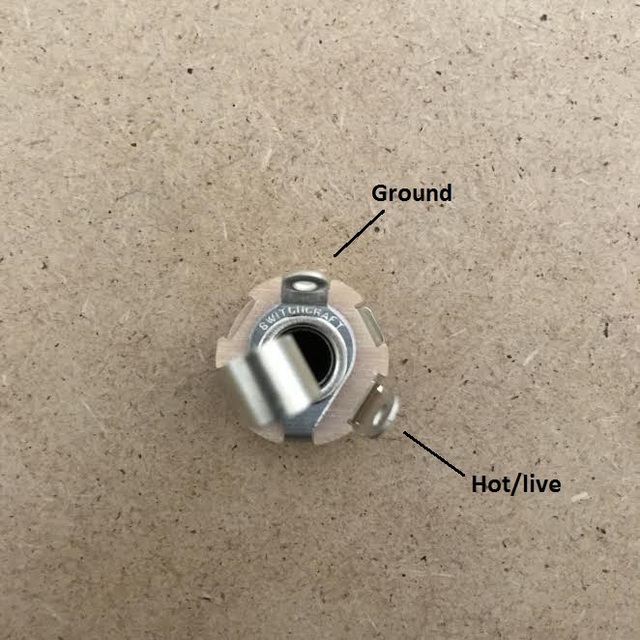 The key to a good solder connection is heat transfer and this is only possible with a clean tip. 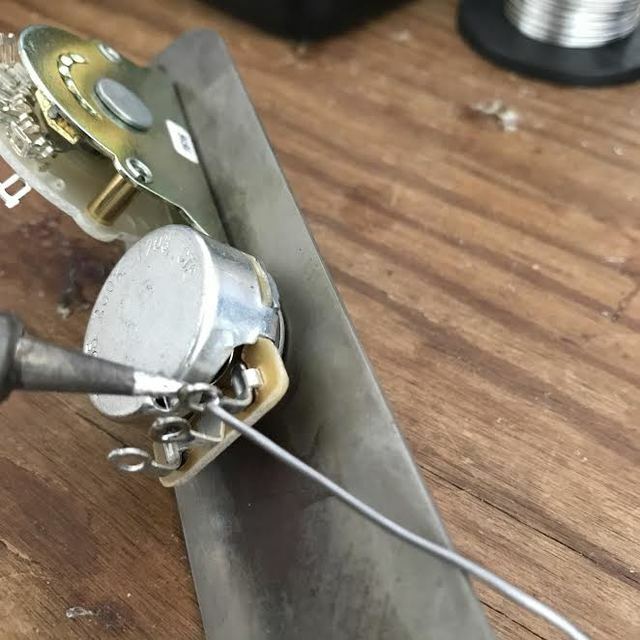 - Tinning - As well as your soldering iron tip, take the time to tin the lugs of pots and switches, the back/side of the pots and the ends of the wire you will be using. Tinning the components makes for a better and more solid electrical and mechanical connection. Assemble the CTS pots and OAK 4 way switch in the control plate as you would with a normal Telecaster - ie. tone and volume controls facing each other. In regards to the switch, it doesnt matter which way round it sits in the control plate - it will work the same either way. Then you need to ground the two pots together, so again, using either the black cloth wire provided or tinned copper wire (to be traditional) connect the two pots either on the side or the back of the pot casing. You'll see below that we have chosen the side as it leaves more space on the back of the casing for your other ground points (pickups, switch and from the bridge). Moving onto the 4 way switch, familiarise yourself with the below diagram - it differs somewhat from a standard 3 way switch. There are five lugs on each side as opposed the four. To make it easier to understand, we have labelled the lugs 1-10 and will refer to them in this way from now on. Start off by connecting lugs 4 and 10 together. You can either go straight across as in the wiring diagram, or as we have below, wrapping it round the switch. Either is fine, though it may depend on the cavity depth of your Telecaster. If it is a thin body, and therefore a shallow depth, it might be best to wrap it round. Next, connect lugs 2 and 3 together - either use a single piece of wire from lug to lug or use a slightly longer piece which you can use to go down the side of the switch and back up as we have in the below photos. 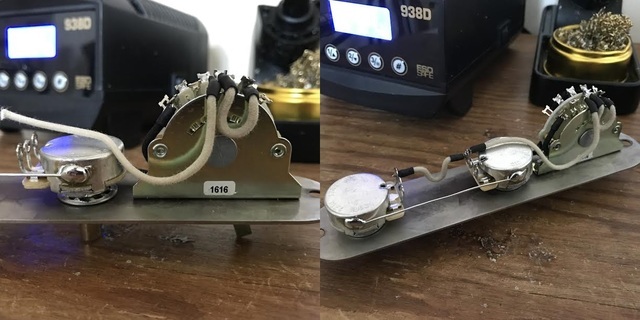 You will then need another wire connecting lug 3 to the back or side of the volume pot. Use the below photos as a reference. Repeat the process on the opposite side of the switch. Lugs 7 and 8 need to be connected and another wire conecting lug 8 to the input lug of the volume pot. 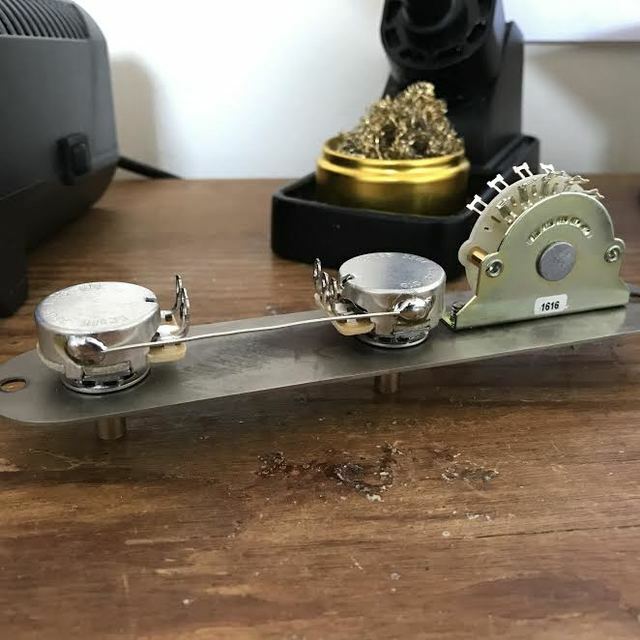 While we are here we can connect the volume and tone pots together. Use a wire from the volume input going to the lug directly opposite on the tone pot as we have done below. Before moving onto wiring in the capacitor, you need to ground the unused lug on the volume pot. 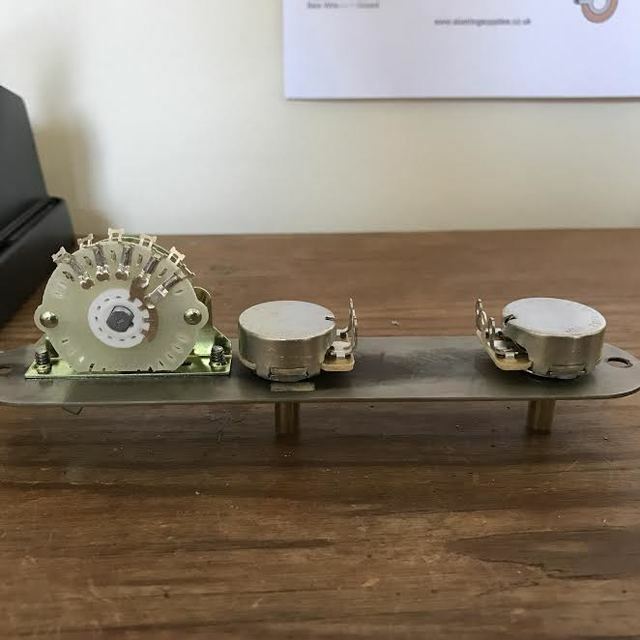 You can either bend it back onto the back of the casing and solder it in place, or, use a snippet of wire and make a connection that way. Below, we have bent it back onto the casing and soldered it. 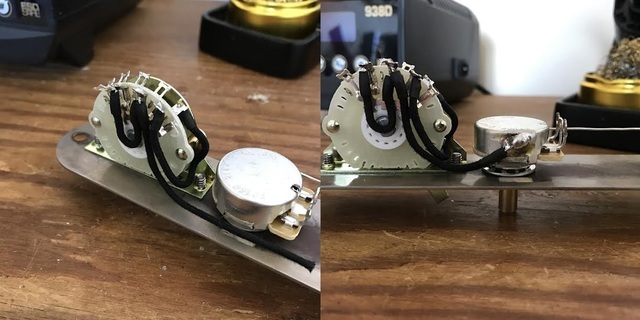 Add your capacitor of choice (0.047uF is recommended) from the middle lug of the tone pot to the ground (ideally the back or side of the casing). Modern Telecasters generally use a 0.047uF but a 0.022uF, 0.033uF and 0.05uF all offer nice variety. Remember though, Telecasters are naturally quite bright, so a 0.022uF will really bring out the twang whereas a 0.05uF will dull it down a litte. Connect the jack's live wire to the middle lug of the volume control and ground it to the back of either pot casing. Use a little heat shrink tubing if need be to keep the two wires neat and together. 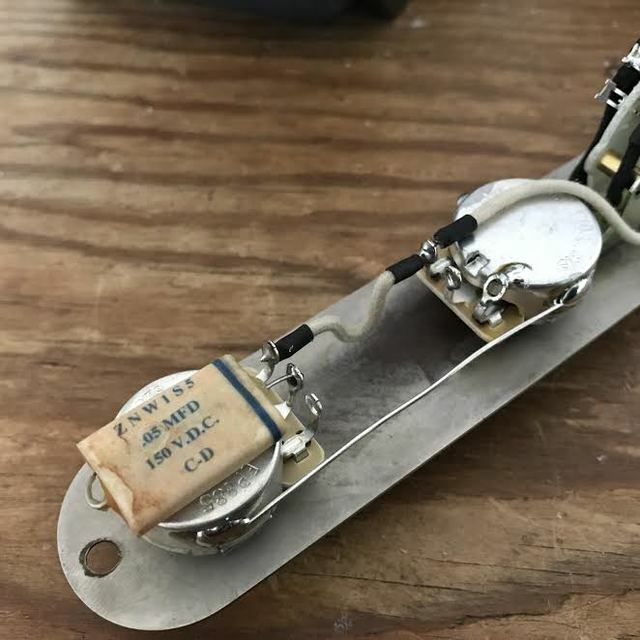 As mentioned at the top of the page, you need to add a third ground wire to the neck pickup and run this ground to the back of the volume pot. Modifying is a strong word in this case as you are not actually touching the internal wiring at all. Follow the two below photos. First, you need to un-ground the metal pickup casing. It is grounded to the pickup normally by a small thin wire on the underside - you need to break this connection. Then, re-ground the casing by soldering a new, third wire to the casing tab and run this to the other grounds on the back of the control pot. Ideally, use a different colour so you know which wire is which - or put some tape around it so it is easily identifiable. That's pretty much it - connect the pickups to the switch and volume pot respectively (following the diagram) The neck pickup ground gets connected to lug 5 on the switch and the second ground you added goes to the volume pot casing. 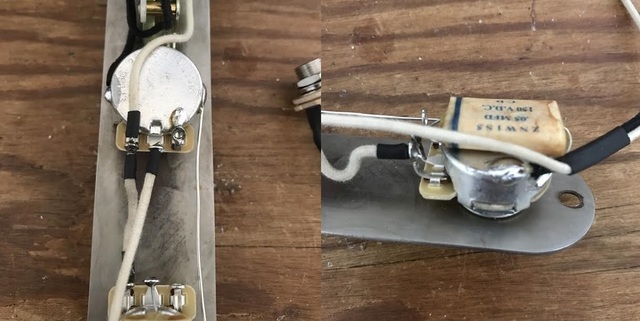 Connect your jack to the volume output lug (middle) and ground it to the back of the tone pot. Don't forget to connect the ground from the bridge to the harness as well. One downside to the classic Telecaster wiring is the loss of high end clarity as the volume is decreased, which can result in a muddy tone. To overcome this you can add a treble bleed/treble pass capacitor over the inout and output lugs of the volume control. This helps to maintain the high end frequencies as you lower the volume, resulting in a clearer and more rounded volume sweep. The 4 way Telecaster mod adds an extra dimension to a cult classic without losing the tonal variety of the 3 way that has become one of the world's most loved guitars.